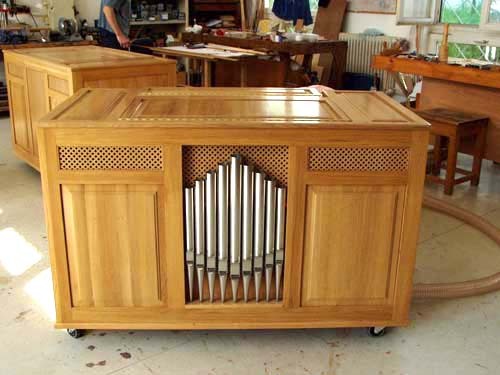 NEW PIPE ORGANS AT THE PRICE RATE OF DIGITAL IMITATIONS! C - g''' 56 keys without a pedal. Stops: Gedackt 8 ; Rohrflöte 4 ; Principal 2 ; Quint 1 1/3 . Stop actions can be switched mechanically in bass-diskant division. The chest is made of oak. Enclosed front or front with pipes (optional). Measurement: width: 147cm ; height: 96cm ; depth: 77cm. The blow-engine is built into the organ seat.